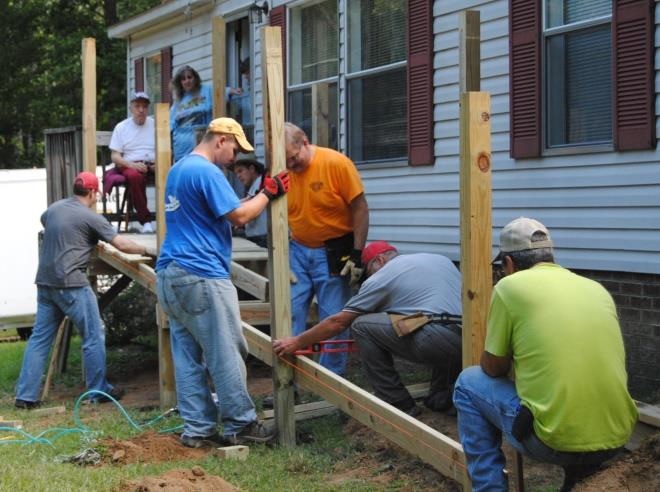 Churches, do you have groups – like the one pictured below — who can lend a hand and help us build wheelchair ramps? Your participation would help reduce a backlog of more than 30 requests – and help us all reach our communities for Christ. What preparations are made before work begins? Before work begins, an RHI volunteer will visit the job site and assess the owner’s physical and spiritual needs. The volunteer will take measurements and draw a plan. Job sites are different and custom plans are necessary. What about materials and tools? RHI will gather the materials and deliver them to the job site and provide tools, as needed. Who will supervise and be responsible for the work? An experienced RHI crew leader. How long does building a ramp take? Depending on the ramp (e.g., straight ramp or ramp with a landing) and the number of crew members, it’s a day to a day-and-a-half job. Where are job sites located? In all the communities we serve, but every effort will be made to assign work in the vicinity of your church. Can work be scheduled on Saturdays? Call the RHI office at 252-438-5132.